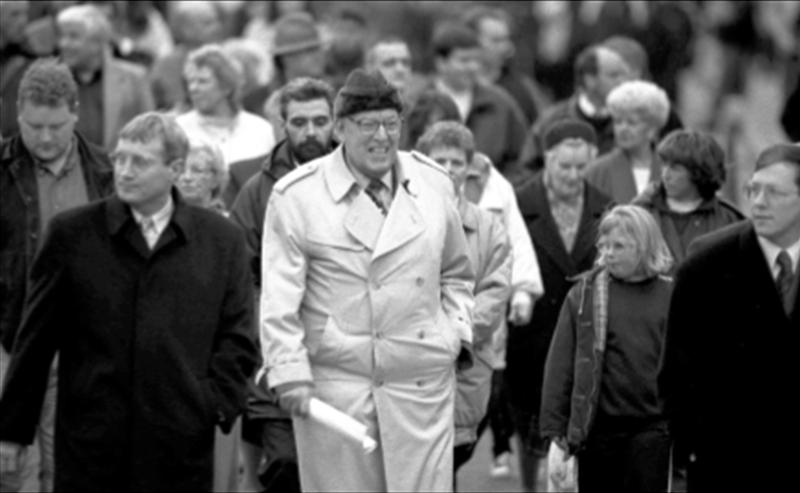 The above picture shows the late Reverend Ian Paisley and leading DUP politician Peter Robinson in the company of UDA killer Kenny McClinton (wearing a dark coat at the far left of the picture, by Ian Paisley’s right arm). McClinton was convicted of two sectarian murders in the 1970s. In March 1977, McClinton murdered Catholic civilian Daniel Carville whilst Carville was driving his son near the Loyalist Shankill Road area on St Patrick's Day. Mr Carville’s lethal wounds were sustained in his back as he shielded his son. Two months later (May 1977) McClinton boarded a bus and shot dead bus driver Harry Bradshaw, a Protestant mistaken for a Catholic. The wider background to the murder of the bus driver was an attempted joint UDA/DUP regional strike which sought to counteract what these groups saw as political appeasement of the Irish. 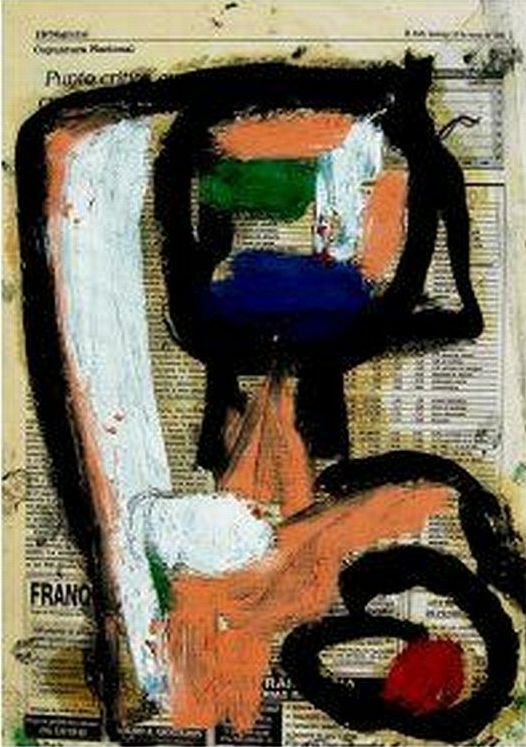 The strike had begun on the 3rd of May 1977 and lasted ten days. Mr Bradshaw was one of many Protestants who refused to join the strike. It has been claimed that the UDA wrote to Mr Bradshaw’s widow to apologise for the murder as they believed her husband to be a Catholic. A ten pound note is also said to have been included with the UDA’s letter. The UDA/DUP strike was a failure precisely because of people like Harry Bradshaw who was killed near the end of the failed protest. According to the definitive book on Troubles’ victims Lost Lives, Mr Bradshaw’s widow said: “I can’t blame Mr Paisley for what has happened, but I can’t say he’s free from blame either.” – see Lost Lives, Harry Bradshaw, May 10th 1977 . The above picture of Kenny McClinton and the two DUP leaders was taken at a 1997 ‘Concerned Protestants’ rally in Portadown, which was organised by supporters of the notorious loyalist killer Billy Wright who had been imprisoned in March 1997 for threatening a woman and her family. The more general protest being made by the ‘Concerned Protestants’ group was that the Protestant way of life in Northern Ireland was under threat from anti-Protestant forces. Likewise, most of the founders of ‘Concerned Protestants’ were supporters of Billy Wright’s Loyalist Volunteer Force – a breakaway loyalist paramilitary group largely made up of UVF members who disagreed with the peace process. Kenny McClinton had a close relationship with Billy Wright and was said to act as a Pastor to the LVF. Both McClinton and Wright argued for the establishment of a Calvinist state in Northern Ireland. Given that ‘Pastor’ McClinton continued to maintain a highly public political profile on his release from prison despite the pain this caused to his victims’ families, we will ignore his claims of having found religion and being 'Born Again' and simply note, what I view as, the imprudence of the two senior DUP figures in being in any way associated with Kenny McClinton. 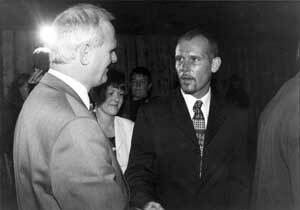 This is a picture of former DUP MP for mid Ulster Willie McCrea shaking hands with sectarian mass murderer and religious fundamentalist Billy Wright in September 1996. This was at a rally, again in Portadown, where McCrea appeared on a platform alongside Wright to denounce those pro-peace process elements within Unionism and Loyalism who had criticised Wright for his hard line stance, criticism which extended to death threats. Billy Wright was imprisoned a short time after this rally for making the threats referred to above. It's only fair to point out that both Ian Paisley and Peter Robinson subsequently made huge efforts to move their support base away from an entrenched sectarian position, and they are to be applauded for this. I believe this shows a measure of regret on their parts for previously held DUP positions, but the pictures above show that the DUP has questions to answer, both past and present, over its dealings and interactions with loyalist paramilitaries. This, therefore, is one of the challenges, not just for Theresa May and the Tory Party, but also for English Democracy. 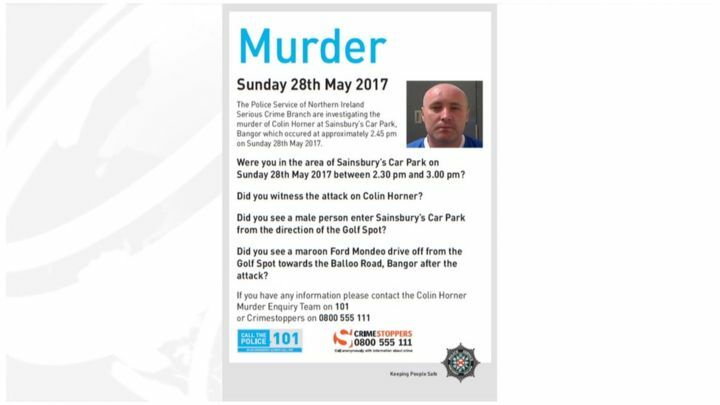 This a Police Service of Northern Ireland (PSNI) call for witnesses to come forward after the murder of UDA member Colin Horner on Sunday the 28th of May this year. Mr Horner was gunned down in front of his son by a rival UDA faction. The dogs in the street know that the UDA has not decommissioned its weapons and is not only involved in murders, widespread intimidation and racketeering but also has links with the drugs trade. This will be news to a lot of people in England, as will the fact that a new generation of DUP members regularly appear at local Northern Ireland occasions alongside leading members of the UDA and make no apology for so doing. 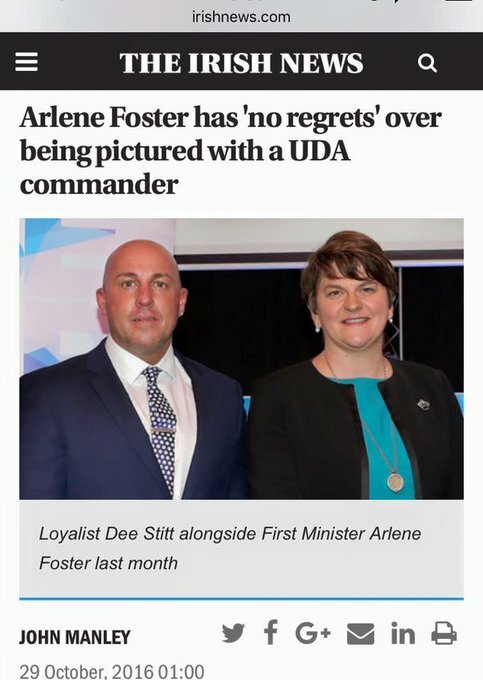 The new King and Queenmaker of English politics, the DUP’s Arlene Foster, appeared alongside prominent UDA commander Dee Stitt in September 2016 during the announcement of large scale Stormont funding for ‘Charter NI’, an employment project in East Belfast. News that Stitt was CEO of Charter NI was greeted with widespread astonishment. Stitt has served a five year prison sentence for an armed UDA robbery in the 1990s. In October 2016, Dee Stitt described a controversial UDA linked flute band in his area (the North Down Defenders) as ‘Homeland Security’. I quote from reports of Stitt's comments at the time: “North Down Defenders is our homeland security. It says it in its name. We’re here to defend North Down – from anybody.” The DUP was moved to criticise Dee Stitt after these comments, but this simply serves to highlight the DUP's problem. To be clear, the Good Friday Agreement encourages the reintegration of former political combatants into society and this includes financial support, but with the proviso that those combatants have no paramilitary role. As things stand, the UDA does not pass that test. Irish nationalism dismissed the DUP from joint-office in the Northern Ireland executive because of a financial corruption scandal involving what we might call a ‘Cash for Unionist Ash’ heating finance scandal (still not properly explained); anti-Irish bigotry (the public ridicule of Irish speakers and Sinn Féin voters in particular), and its clearly homophobic and anti-equality agenda. In other words, the DUP was kicked out of office in the North of Ireland and asked to come back when it shows a more serious commitment to the equality and democracy ethos, which lies at the heart of the international treaty that is the Good Friday Agreement. There is a huge irony in the fact that the DUP is not seen as good enough in Ireland but may be good enough for a badly wounded Tory Party in England, on the highly dubious basis of 'any intolerant port in a storm'. The DUP has no mandate and no support in England and the only way that Theresa May can retain any shred of credibility in her courting of the DUP so as to cling to office is to insist that they join the rest of the 21st Century by implementing the GFA agreements already made with regard to parity of esteem for all and a firm pledge to actively pressure the UDA into finally giving up its illegal activities. This would entail the opposite of throwing money at the UDA and being involved in controversial, insensitive and ill-advised joint photo-ops.